During the 1980’s major environmental organizations, including The Earth Island Institute and Greenpeace, began awareness campaigns alerting the public to the fact that a large number of dolphins were dying in tuna nets every year. The resulting consumer backlash and pressure has led to a ‘Dolphin Safe’ labeling system for canned tuna and other tuna products. Dolphins are regularly associated with large schools of tuna fish and one method fisherman use to find certain species of tuna is to follow dolphins. Unfortunately, when the fishing vessel brings in the net (usually a large purse seine net) a number of dolphins get caught and are dumped overboard with other bycatch from the net. It was this type of fishing method which led to a large public backlash and demands that tuna boats employ other techniques to catch tuna which minimize bycatch and the number of dolphins killed. In addition, the canneries that had tuna for sale or canned tuna for sale began demanding harvesting that minimized the dolphin kill rate. This led to new harvesting methods using tuna location systems such as fish aggregation devices. However, by protecting dolphins many of these new harvesting methods have increased the bycatch of other species. By using fish aggregation devices rather than dolphins to attract and find tuna, many other species of marine life are attracted to and caught up in the tuna nets. This has led to some claims that the label ‘dolphin safe’ should be given little attention and other forms of labeling which protect entire ecosystems (dolphins included) such be given precedent. There isn’t one single standard and certification program for a dolphin safe label. In the early 1990’s the U.S. government created labeling standards for dolphin safe labels and many other governments have also followed suit. In addition to government standardized labeling some independent organizations, such as The Earth Island Institute, have also enacted their own certification programs for dolphin safe tuna. Typical standards for dolphin safe tuna include stipulations that no dolphins can be killed while tuna fishing and that dolphins that are caught in nets must be set free uninjured. The Earth Island Institute’s label certification is similar but includes slightly different language. 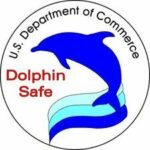 Some recent concerns over dolphin friendly labeling include issues with FAD’s and verification of the dolphin safe certification. For many consumers who are thinking to buy canned tuna or to buy tuna products looking for the dolphin friendly or dolphin safe label is very important.